Write It Down: "3-D House Of Ducks"
On the last day of grade five, I was devastated upon learning that I would not be in the same class as my friends. When I was outside I saw Mr. McDonald, Ian's father waiting for him. I smiled politely not to reveal my disappointment over what had happened. My motive this semester in being studious was that I could be with my friends. I was completely crushed, but my mother was able to fix it that I would be with them. Once it was confirmed that I was in Mr. Pugh’s class, I immediately dialed Ian to let him know of the good news. One day I had to run some errands with my father at “Northland Mall”. I went inside “Comic-Kazi” to see if by chance they had back issues from the Gladstone II era. The clerk told me there were no back issues, but he would take a look at the stock room to see if there were any. When he came back, he held a copy of “Maharajah Donald”, which was this year’s “Free Comic Book Day” offering. He told me there was a spare issue leftover. I asked him how much the price was? He told me it was - free. Then I had to clarify what he meant by - free - as I was dumbfounded that he gave it to me. This was the first I discovered of the then-new publisher, Gemstone Publishing, having acquired the Disney comics license. Be still, my beating heart I had a ransom list of Carl Barks’ stories for reprinting. 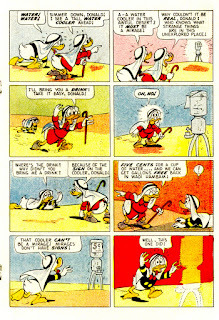 (Look at us now with Fantagraphics reprinting Carl Barks and IDW printing current Disney comics!) We went to the Nose Hill branch of the Calgary Public Library. When I was looking for an animation-related book, I was stopped in my tracks by one on the shelf – “Donald Duck: 50 Years of Frustration”. What ducky surprises I had that day! I imagined this was might have felt like to be on a streak of good luck, like Gladstone Gander. During that month, I was mesmerized by the facts that were printed here. I appreciated how well the book covered his life in animation and comic-books. 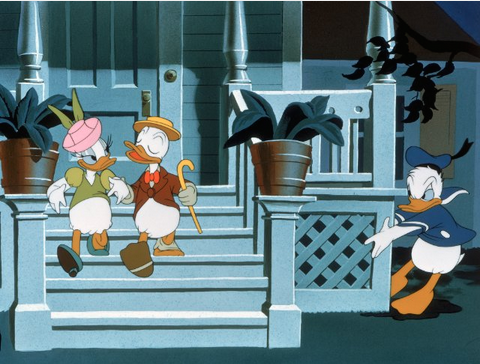 The smattering of photographs of animation-director Jack Hannah, voice artist "Ducky" Nash, and Carl Barks was icing on the cake. This was LONG before the days of YouTube, where one could type in the cartoon you had never seen. 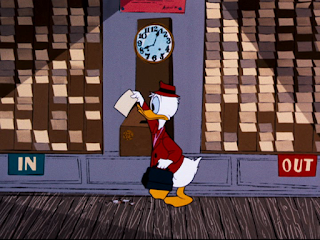 I was in heaven as I saw stills from many Donald shorts. I spent many days drawing many pictures from here. The following week, Ian called me over to his house. Ian skateboarded around the block while I rollerbladed. Then we played Nickey-Nickey-Nine Doors. Ian, the instigator of the game was having the time of his life watching me as I went door to door. I was fretting about getting caught by the time the homeowner arrived at the door. There was one house with a staircase; I was worried of falling flat on my face while walking hurriedly down the steps as I wore my rollerblades. 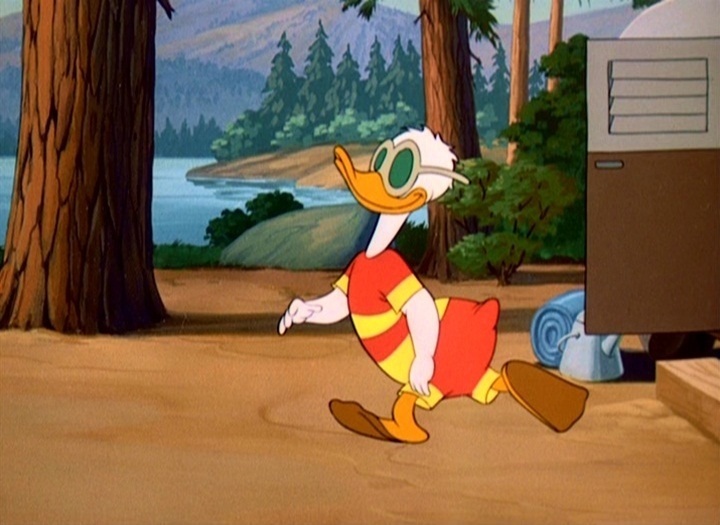 Early one day the DUCKTALES episode “Attack of The Metal Mites”. It was great seeing how Fenton without his Gizmoduck suit removed the metal mites by using his intelligence. I had wanted to see what I believed to be was the final episode of the show. Later that day while I was channel surfing, I stopped at one channel showing a clip of Donald lighting his pile of leaves ("The New Neighbor", 1952). That clip was one of plenty excerpted in the special "DOWN AND OUT WITH DONALD". Thankfully I had a spare video to record it. The “duck-umentary” was similar in the vein of 60-Mintues tracing the life of Donald after a career-ending incident. I was giddy when it was airing on the Family Channel that I called my dad at the office to tell him of the news. Among the artists whose music aided to the soundtrack of this special were: “You’re No Good” by Linda Ronstadt was over a montage of clips showing his breakup with Daisy, Dolly Parton’s “9 To 5” played over clips of him trying new careers, Steppenwolf’s blaring hit “Born To Be Wild” went over old clips of him vacationing, and lastly Weird Al’s farcical song “I Want a New Duck” coincided with his temper under control. The selection of clips to the songs lyrics was appropriate. The lyrics from "Nine To Five" - "..Yawnin', stretchin', try to come to life" complement the bleary-eyed Donald. His comatose expression is what comes to mind when I wake up early. I identified most of the cartoons that were excerpted in the special. 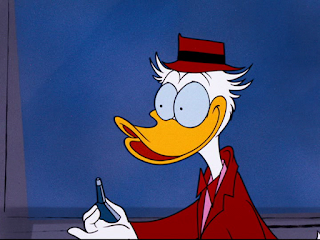 The “duck-umentary” cleverly intertwined clips from old Donald shorts sometimes with new voice over. For example, when he was returning from his vacation, he heard one radio announcer (Paul Frees) about him heading into parts unknown; he switched to another station I heard the nasal tones of Harry Shearer using a voice that he used for the irritating radio hosts on THE SIMPSONS. Another set of lyrics, "They just use your mind and you never get the credit" perfectly accompanied the scene from "How To Have An Accident At Work" (1959). Donald's mind blanking out, with his shrunken pupils, encapsulates when I would lose focus in elementary school. Spencer invited me to join him, his sister Megan, and his cousin Matt to “Calaway Park”. It was a very enjoyable time waiting in line for the rides. I recall pointing out a roof covered in pieces of gum. On the way back my mom took me to the Dalhousie branch of the now defunct Roger’s Video. I picked up “Cartoon Classics: Chip N’ Dale” so I could finally view the cartoon “Trailer Horn”. The music, in the beginning, was serene when Chip and Dale were sleeping. Donald repeatedly blasted the chipmunks with his horn was amusing. I joined my mother and our neighbor for a walk to the library. I preferred to ride on my scooter to there. Initially, it was relaxing, but as I descended the steepness of the slope made it extremely nerve wrecking. Had I passed through the difficult part of my excursion? Not by a long shot my friends. What lay ahead was gravel that aided in scraping my knee on the asphalt. I limped all the way back home. Later I went with my mom to “Roger’s Video” and rented “Cartoon Classics: Donald & Daisy”. I was exhausted from that event I went to bed early. The first thing I did when I woke up was to view the video. 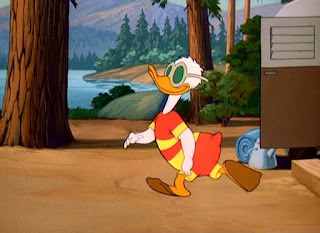 In “Donald’s Double Trouble” the animation of Donald in the telephone booth exploding on the other end, as Daisy slammed the telephone was animated very well. It symbolized how explosive their relationship was at that time. 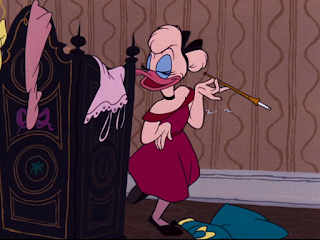 Donald’s doppelganger eyes bulged upon seeing Daisy’s picture, reminded me of the wild “takes” that characters in Tex Avery’s cartoons exhibited. 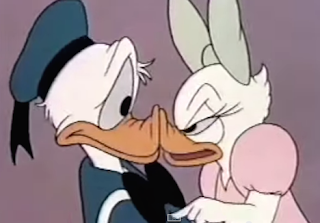 Donald’s repulsed reaction increasingly grew each time Daisy advanced on his double was coupled by a ringing sound effect, which effectively conveyed his infuriation. The ending of him hugging his double on the “Tunnel Of Love” was hilarious, but a bit racy. My sister joined me towards the end of the cartoon she remembered seeing it in her childhood. 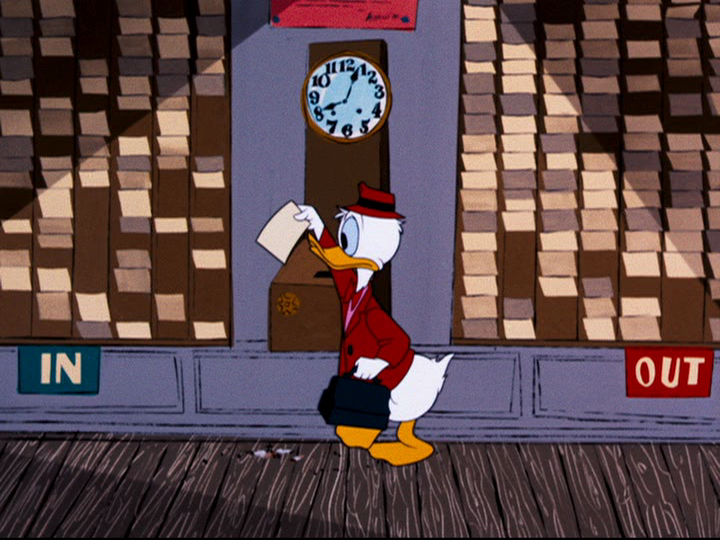 The short was followed by an interstial of Daisy showing Jiminy Cricket Donald’s diary, which led to the eponymous short. 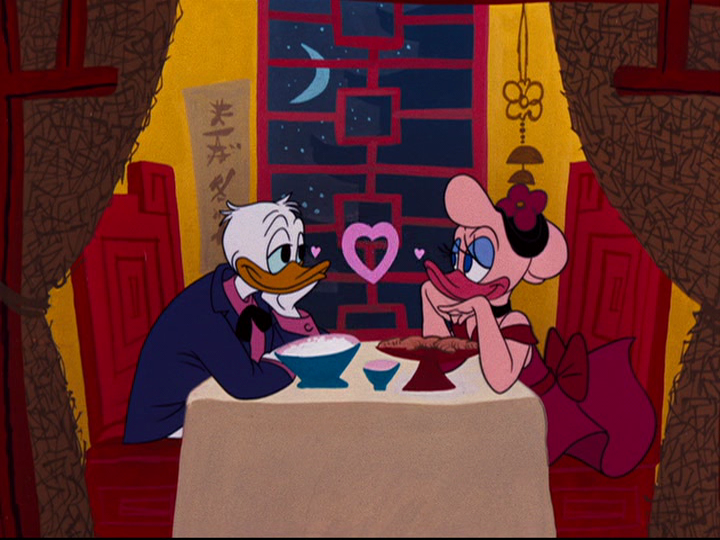 I found it odd hearing Russi Taylor voicing Daisy then it switched to June Foray voicing her. An example of one of the bridging sequences repurposed with new voice over. It was one of the more “adult” Disney cartoon I recall viewing. It was odd hearing Donald’s narrative voice being sophisticated and articulate. Daisy in contrast to her earlier appearances was redesigned with her hair in a stylish bun, her color was peach, and she seemed bustier. From "Donald's Diary" (1954) a smoking (!) Daisy with her lingerie scattered over the partition door was one of many scenes that seemed odd to a twelve-year-old me. The beige skies, the hues of read, and charcoal grey contrast each other. The architecture behind her captures the era of fifties San Fransisco. 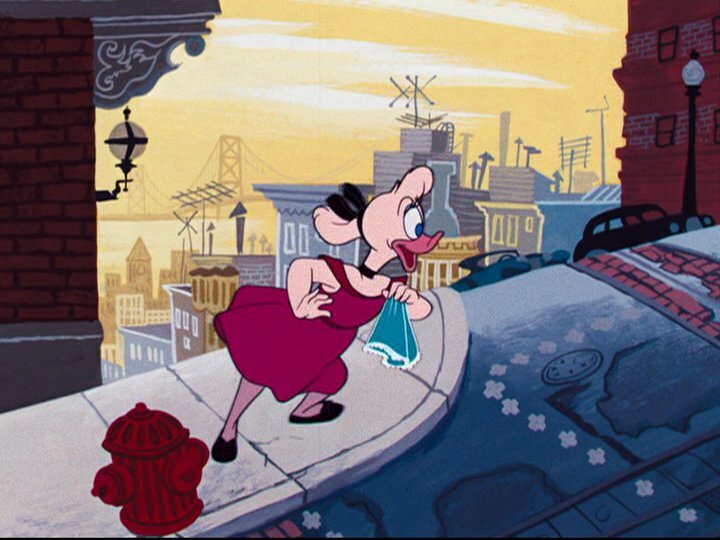 Many of the modern-esque backgrounds of Ralph Huttlett. The subdued color choice in this scene add to the romantic mood. I did not understand the satire of a married life; as a result, many jokes passed over my head for example: When Donald and Daisy carved their initials in a tree. The camera pulls back to reveal that her previous boyfriends have etched their names on the opposite side of the tree. Daisy noticed that her engagement ring changed color. Who can’t forget the scene when he sees her bride with curlers drinking coffee? As the flavor of wine enhances with age, this cartoon appealed to me once I turned thirteen. The series get well cards I dew for my grandmother. I drew a series of get well cards for my grandmother, who underwent a hip replacement. I gave the drawings to my mother when she was going to visit her. When my mom was not at home it was a lot of fun. I would wake up late in the afternoon, have breakfast, go through my math questions, surf on the Internet on websites about Carl Barks, and read comics. The first drawing while my mother was away. 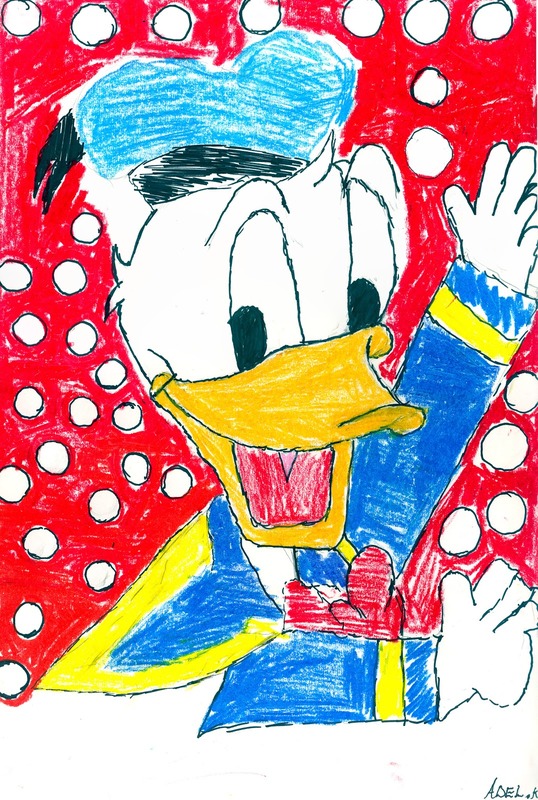 Based on a Donald Duck pillow I had. One morning I was chipper I woke up early, then I tried to solve some math questions, and did some drawings of Donald. While I was waiting for my dad to wake up I watched “Sing Yourself Silly!” one of my SESAME STREET videocassettes. Ernie singing “The Honker Duckie Dinger Jamboree” and “Put Down The Duckie” was just as ducky when I was three. 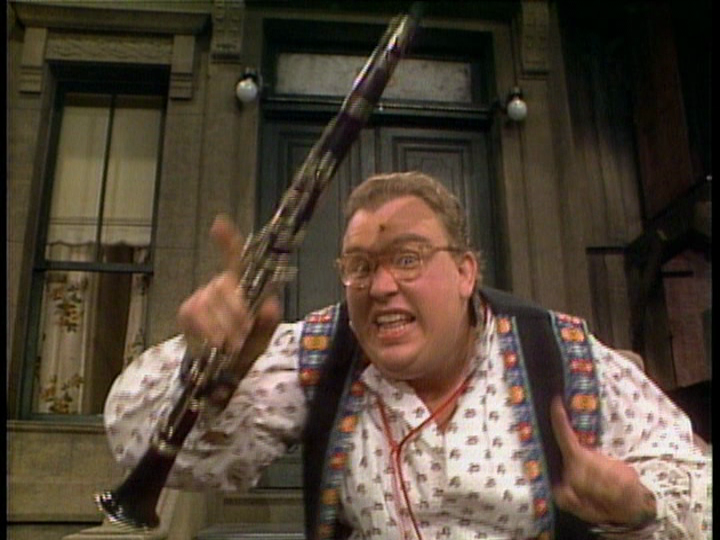 The later song was impressive for the celebrities included in the montage; among them were Paul Simon, John Candy as Yosh Shmenge, and Andrea Martin as Edith Prickley. Later in the day we were sketching, he showed me his renditions of Batman complete with a square jaw and a perfect Gyro Gearlose in pastel. His method of drawing was drawing an outline then breaking the face into four quadrants. As a three year old, I wondered who this bizarre man twirling the clarinet was. Who could imagine that I would encounter a person relate to him. Listen to Yosh Shmenge! The following week to keep me occupied on Saturday when my sister and dad would be out. I went with my dad to “Blockbuster” and checked out a Three Stooges tape entitled “Dizzy Doctors. I was tempted to watch it immediately, but my dad suggested that I wait until tomorrow. Instead, we viewed another installment in Blake Edward’s canon of Pink Panther films “The Pink Panther Strikes Again” (1976). The relations between Inspector Clouseau (Peter Sellers) and former Commissioner Dreyfus (Herbert Lom) are tense. 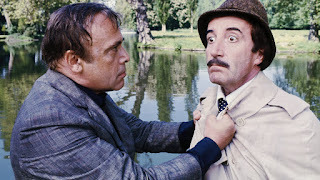 Peter Seller's exaggeration of Clouseau's French accent was mirthful. 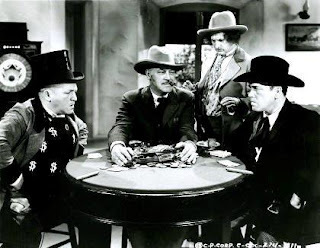 I was eager to view “Goofs and Saddles” one of the shorts on that videocassette, as I had seen a snippet from the short of Curly in the bandwagon when it was included in the compilation “Stop, Look, and Laugh” (1960). Those boys looked “mighty purty” with their long hair and mustaches. The boys attempt to cheat during the poker game was fun. The highlight was when Moe and Curly who each had two aces and attempted to pass cards to each other, only they each hand each other their own aces! The climax was exciting as they escaped from Longhorn Pete’s saloon; I vividly recall Moe and Larry jumping from the window onto the covered wagon. The dollar signs on Curly's apparel reminded me of you know. One of the highlights was when Ian would return from his cabin in Invemere, B.C. We took turns arranging a sleepover at each other’s house. When we were deciding which film we should view, I already had in it mind based on a conversation in grade three. When we had not known one and other closely, I brought up the topic about who his favorite comedy teams were. I asked him if he had ever seen The Three Stooges? He replied that they were one of his favorites. As I recalled the events of a Stooge short, “Tassels In The Air”, he interjected the scenes he found to be humorous. Especially Curly’s wild expression whenever he saw tassels, and how Moe and Larry would calm him with a brush. He later told me that he was related to John Candy. I raved about how it was awesome to have had him as a relative. Had I known of John Candy’s sycophantic character William B. Williams that he played on “SCTV”, I would have clapped my hands and have laughed cheaply. Come time to when we were planning our sleepover, the question about what film to watch came up. I suggested Mel Brooks’ film “SpaceBalls” (1987) because I knew he would enjoy it as much as I did. Once I mentioned that it stared Mr. Candy he was inclined. A slight addendum, a couple of years when I religiously watched The Three Stooges on the weekends, (or as I called it "Stooge Saturday and Sunday") "SCTV" would precede it. I always liked the fast opening that would show a clip of the cast member, then shrink to reveal four squares with the characters he/she played. When I heard that theme, with televisions being tossed about, it was a signal that I was half-an-hour away from the slap-stick antics of The Three Stooges. From watching the opening I was aware that John Candy was a regular on the show, although I never paid attention to the characters he played. During my conversation with Ian, this screenshot was in my mind as I relayed the credits of his relative to him. On the way to his house, my sister and I were listening to Petula Clark’s hit, “Downtown” in the car. I could not help but recall Groundskeeper Willie’s off-key rendition in “Homer’s Barbershop Quartet”. As we passed “Marion Carson Elementary” I pretended as if I was revisiting it after a long period, as Uncle Scrooge did in the DUCKTALES episode, “Back To The Klondike” I always enjoyed being in the company of Ian’s family. His mother, sister, and father exuded warmth once you entered. It was a glorious time once I dropped my duffel bag into his room. I was skittish about taking the upper bunk bed as I had a fear of it collapsing, as I had seen the repercussions once Curly lied down. Ian was beaming with enthusiasm about the television that was in the basement was now in his room. He showed me the VHS releases of “Bart The General” and “Bart The Daredevil”. We were two pals without a care in the world. The home where my late friend, Ian McDonald resided. Many's the time we would walk back from school to here. It was always filled with many merry moments. In my minds eye, I can see the arrangement of all of the rooms. First we went to his backyard, bounced on his trampoline yelling “Tramp-amp-oline” as Homer referred to it. Then we took turns swinging from a tree and landing on the trampoline. Once we were exhausted, we headed to Ian’s room where we watched “Homer’s Barbershop Quartet”, the very episode I had in mind earlier today. I can never forget watching it on his television with dials to the side. When I listen to “Baby On Board” it opens a flood of memories. Bounce after bounce propelled to enormous heights of ecstasy. 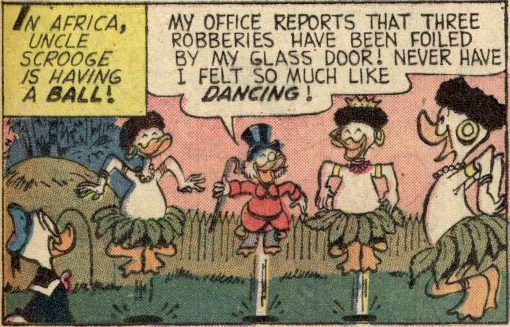 The panel from "The Unsafe Safe" (1960) by Carl Barks is what I pictured when I rebounded from the trampoline. I imagined that this must have been what Uncle Scrooge experienced. After a scrumptious super of our favorite meal, Macaroni and Cheese, we then went to Roger’s Video to look at what another film to rent. Back when VHS had not been yet phased out it was neat to see the array of titles down the aisles. When we came back we started our movie night. On the videocassette where I taped “SpaceBalls” the DUCKTALES episode “Robot Robbers” preceded it. Towards the end of the episode, Ian told me that Flintheart Glomgold reminded me of him. 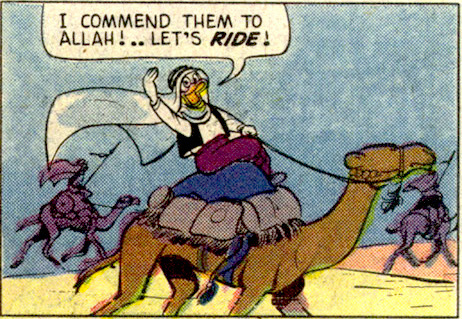 I was surprised as he was the most despicable of Carl Barks’ creations. This was the exact point where Ian told me that Flintheart Glomgold reminded him of me. I was touched by his enthusiasm for my interest. Isn't it funny, how I think of him when I watch this scene in particular. We snacked on popcorn and drank Coca-Cola while viewing “Spaceballs”. The both of us delighted in Mel Brooks’ spark of humor, from the many meta-references in his film (Dark Helmet obtaining a bootleg copy of the film to find out what to do next), Dark Helmet (Rick Moranis) using “the Schwartz” to crush their testicles, the many expletives uttered by many of the characters. Early in the film, Lonestar and Barf owe a debt to the major gangster, Pizza the Hutt. We liked how the villain's name was an allusion to our favorite dining place. Pizza the Hutt's costume was believable with the gooey cheese and the steaming toppings. 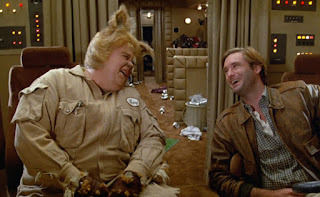 The rapport between Barf (John Candy) and Lonestar (Bill Pullman) echoed that of our friendship. The final scene of Dark Helmet, Colonel Sandurz, and President Skroob leaving the escape pod elicited chuckles until our stomachs ached. In typical Mel Brooks fashion, it was complete anarchy with everyone running for the Escape Pods in the film's climax — the orchestra, a variety of circus freaks, and even a bear. John Candy's sincerity radiated with such lines as " I'm a mog: half man, half dog. I'm my own best friend! " The next day Ian’s aunt took us to the science center. On the way there we had an interesting conversation about which comedians were Canadian. She asked us if we were familiar with Jane Goodal, as we were going to watch a documentary on her. Ian said that Jane Goodal was known for her exploiting monkeys in order to unearth diamonds. She asked him where he had learned that from, he said it was from an episode (“Simpsons Safari”) of THE SIMPSONS where the family won a trip to Africa. We were all laughing as he described what happened. It was tremendous fun playing around the various exhibitions over there such as building Lego cars and racing them, a Rube Goldberg-esque contraption that allowed you to control where a ball would land. I admired how hospitable Ian’s family treated me when I stayed over at their house. It was a fun couple of days spending with him. What happened on the faithful day of Monday, September 1? I was treated to a meal of teriyaki chicken that was on the BBQ prepared by my father, served by a side of rainbow tortellini smothered with a rich alfredo sauce that my sister made. That night, from the Abbeville book of Uncle Scrooge stories, we read out loud together – “McDuck Of Arabia” (1965). 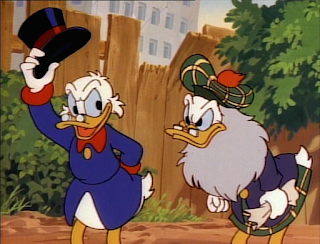 It was one of the Uncle Scrooge stories in his collection. There was agitation when the Hassan Ben Jaild threatened Huey with his weapons. I always liked how ingenious Huey was arranging the rocks in the shape of an arrow when he was kidnapped. I liked the movement in the first panel of Hassan twirling his revolver. In the second panel of him drawing out a sword with the "toing" sound effect adds to the ominous nature. In the second tier, Huey's anxiousness and the shading behind him convey his plight. We thought the Junior Woodchucks was an appropriate organization for Donald’s nephews, as their resourcefulness was utilized. 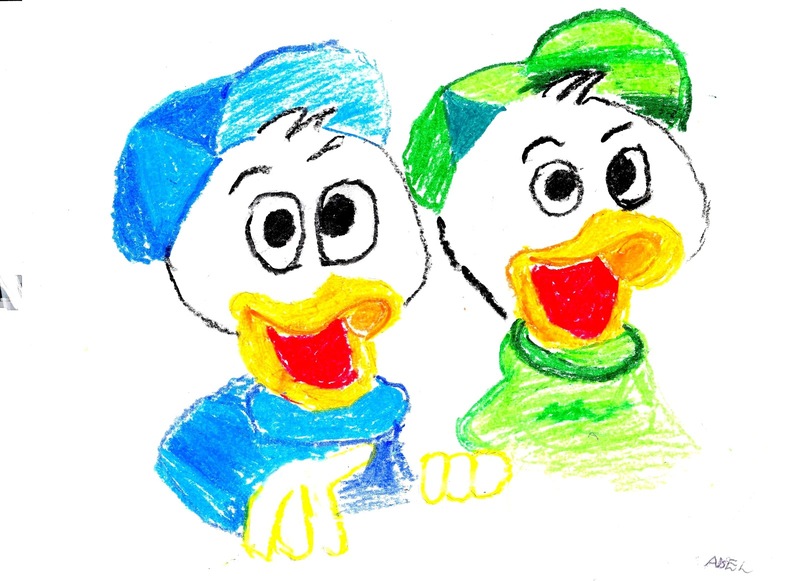 In this story, it was demonstrated by Dewey and Louie in collaboration with the Arab division of the JWs, named, the Desert Patrol Six Four Six rescue the kidnapped ducks. We liked the witty name of the villain – Sheikh Hassan Ben Jaild. 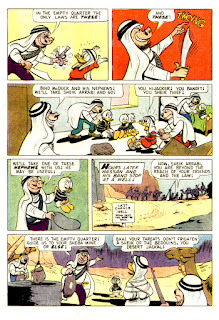 Carl Barks design of the sneering pig villain with – snout and beard worked well with Hasan Ben Jaild’s unscrupulousness. Two years later I had the pleasure of briefly experiencing a sandstorm in Kuwait, I could relate to the one Don and Scrooge were in. Carl Barks’ drawing was stellar as ever. 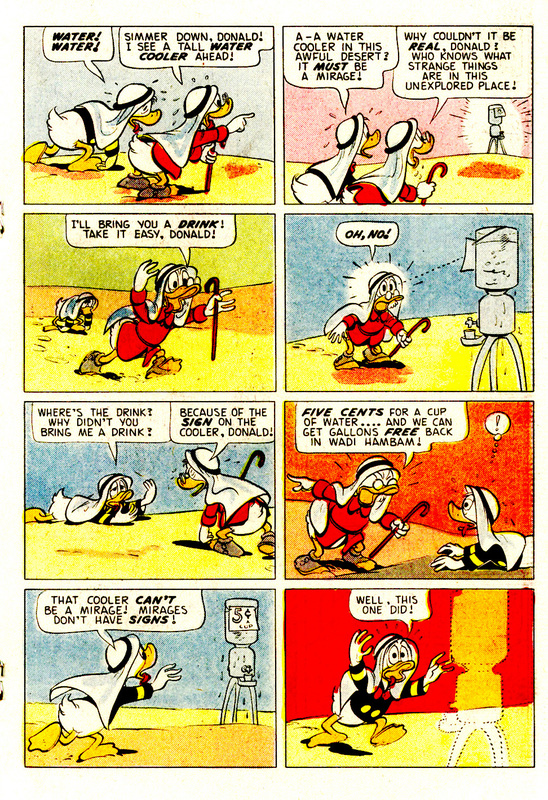 His expressions for the dehydrated Ducks as they cross the desert made me feel what I was like as Uncle Scrooge and Donald crossed the “three-hundred miles of emptiness”. The portrayal of a full-scale assault of Uncle Scrooge and the Bir Shebans made me feel is if I were there. Not a bad way to end Labour Day on. 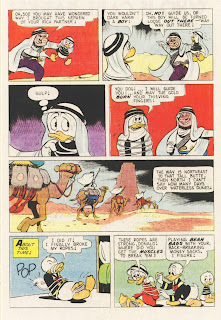 Uncle Scrooge's caption made me imagine the glittering surface of the land of Bir Sheba. Seeing Sheikh Arrabi mentioning the deity, I worship Allah was cool. It made me appreciate the lengths Carl Barks devoted into researching his stories. 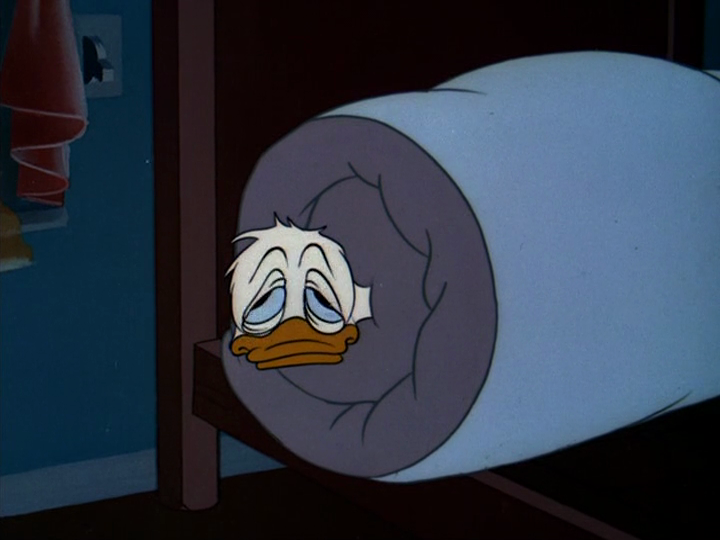 The following morning as my dad was leaving for work, I mentioned second bottom tier, where Uncle Scrooge would not sacrifice five cents when they could drink for free at the hotel. It got a chuckle from the both of us. As I went to bed that night, I lay awake for most of the night thinking what wonders of the school year were in store. I also thought about how I was anxious the previous year when I looked at the class list and found out I was not in the same class as my friends. As I couldn't sleep that night I would talk to my dad about the supporting characters in Disney comics (i.e. Daisy Duck). It reminded me of SESAME STREET where Ernie would keep Bert awake at night.